This is What a Dental Practice Should Be! I am 57 years old and have never had a more pleasant experience at a dentist office than this. From the moment we walked in until we left – it was amazing. Dr. Marsh came out and greeted us while in the waiting room, then we were given a tour of the facility. I have never had a dentist sit down to explain things the way that he did. This is what a dental practice should be! Dr. Marsh is not only very personable but is extremely knowledgeable. He explained with drawings, pictures, and words so he was very detailed in helping patients understand his thought process behind the treatment proposal. I also like the fact that there are gallery photo books of actual patients. The Real Deal of Excellence! Thank you for your sincere care throughout my veneer process. I’m sorry that I drove you crazy with my fears and wouldn’t have proceeded without all the kindness, assurance, and patience I received from you all. And of course, THANK YOU Dr. Marsh, too, for the great job and services! You’re the real deal of excellence! Some One-Liners from Some of Our Most Valued Patients! You guys are the best! I am not the greatest dental patient and with this last procedure, I had the most difficult time. But because of your care and professionalism, the whole thing was made so much more bearable! Thank you for your kind attention and follow up. My “thank you” seems so small compared to all you and your staff have done for me—you improved my health and life—but it comes from my heart. You’ve restored my faith and trust in dentistry. You are a gift to my life. Thank you for all you’ve done. I have been blessed and honored to be one of “your fans” on the dental road of life. I am so glad to know you and the rest of the wonderful people you work with. You take such excellent care of others, I know I feel like a V.I.P. when I am with you and your staff. I love my teeth! Dr. Marsh, you’re the best! I cannot tell you how much I am enjoying and appreciate the dental bridge. Every time my tongue hits the teeth, I think of you and your staff. It’s only a shame the bridge is in the back of my mouth! I want you to know how much I appreciate your help. You do your job so well, but you go above and beyond. I feel it comes from your heart. Lost 27 lbs After Dental Work! You have so changed my life! I’m the happiest I’ve ever been. You didn’t tell me one of the benefits of all my dental work was I was going to lose 27 pounds!! I eat so much healthier now…brush and floss all the time, and anyone who will listen I tell them the same thing…brush and floss. Dr. Marsh, you are truly the best!! Thanks for everything! My visit to Dr. Marsh’s office was the best thing that ever happened to me. After numerous dentists told me I would need dentures, he told me he could rebuild my smile denture free. After about 4 visits to his office, my teeth were done and looked great. 2 years later, no problems and many compliments on my smile. I would highly recommend Dr. Marsh and his team for all your dental needs. And on top of that, it was completely pain free! I am so happy. All I keep saying is wow, wow. Unbelievable. You shocked and amazed me! Although these temporaries feel like I’m wearing the whitening tray, I can see your vision. Have you seen the side view? It’s awesome too! No one I know has seen this work of art yet. However, on the way home and at the bank, folks that would normally not chat it up with me were. I swear I had a different spring in my step. Thank you and your wonderful staff. You should definitely use my pictures, of my mouth only, for a true testament of your great work. I can’t wait to go buy lipstick tomorrow, as I haven’t worn it in over 30 years because it seemed to draw more attention to the bad teeth. I am so very grateful for the unbelievable change in the appearance of my teeth. I would never have believed that you would be able to do anything for me, especially at my age. I have always been so very self conscious because of my teeth. I am grateful to God that I was able to find you. You are a very gifted and kind doctor. Your assistants are wonderful and professional. Thanks for Adjusting Your Schedule to Accommodate Me! I wanted to take this opportunity to express my gratitude to you for being so kind in adjusting your busy schedule to accommodate my needs. … when I think back to approximately fifteen years age, when you took charge of my dental needs, this is, indeed, a typical example of the character of Dr. Marsh, whose primary concern is that of his patients. It has been an honor and privilege to know you. Thank you so much for everything you have done for me. You and your staff made me feel comfortable and helped me relax which I didn’t think I could. I love you and everyone there, and I am over the moon on how my teeth look. I never thought I could have a sensational smile again, but that was before I met you! Having had a mouth full of 20+ year-old porcelain-on-metal crowns that were dull and lifeless made me feel self-conscious and, quite frankly, pretty old! Now, after just 4 short visits, I have a smile to be proud of—it’s simply fabulous! Of course, all the perfect strangers I’m beaming at may wonder why I’m smiling so much! It’s just me showing off my newfound feeling of youthful exuberance and delight with a whole new look. Your talent and artistry made it all possible. My sincere thanks to your entire staff … and especially to you for changing my life! I’ve had to take a pause before writing you. It’s been quite a ride. I was originally drawn to you and staff because of the Jay Leno article in The Plain Dealer. What drew me in further when I met you was this feeling that you had a real passion for your work and seemed to be genuinely a nice person who cared. I was right. I’m still in a bit of a Twilight Zone figuring out the new me with a mouth that wants to smile openly, brightly and often. My husband, family and friends think you did right by me as do I. Who would have thought a left-handed sort of guy could pull off such perfection!! Warm regards to you and your special team. I just wanted to say thank you, again, for giving me my smile back. You have the best staff and I actually looked forward to coming in. Karin, your kindness and “pep talks” kept me going until the end. Making payments took the stress off too! Don’t change a thing. I’m spreading the word! I was sent to Dr. Marsh in 2006 for veneers on my upper teeth. I was anxious about going to the dentist because of a few bad experiences but Dr. Marsh eliminated my fears. Veneers are still one of the best decisions I have ever made. I went back to Dr. Marsh to have my veneers checked up on and fell in love all over again. You couldn’t ask for a better environment. From the friendly staff to the way Dr. Marsh treats you, it made me glad I found them. Total life changer for me. I write today to express my gratitude for all you have done to make me smile these last few months. Thank you for the care, skill and concern with which you guided my dental needs. 10 beautiful teeth smile back at me when I look in the mirror! I was so surprised and touched that you had a tree planted in Israel in memory of my father. Thank you for your thoughtful gift in memory of a wonderful man. I just wanted to say thank you for taking care of my chipped front tooth. It feels so much better tonight! I appreciate your skill and the fact that you were able to fit me into your busy schedule so promptly. In today’s climate, service and quality are so important! I also appreciate your friendly, accommodating staff. I want to thank you for what you have done for me thus far. Your staff and yourself are so caring and professional; you made me feel right at home. That means a lot to me. With just the whitening treatment so far, you have opened up a whole new world to me. I can smile and laugh now without covering my mouth in shame. You’ve given me new confidence. This was by far the best experience I have had with any medical provider, period (dentist, doctor, dermatologist, etc.). I have lived in a lot of different places and can say without doubt that you all are an exemplary organization, with a true desire to better the lives of your patients. Your outstanding service should be used to teach and guide other organizations how to improve. Thank you for being genuine, beyond accommodating and thorough with my visit. I would recommend this office to everyone, and should I move away from the Cleveland area, would be willing to drive back to Cleveland for my dental appointments. Long time patient of both Dr. Sam and Dr. Steve, Elaine, passed away suddenly on Friday. We are so grateful for the warm, skilled care that through the years made it possible for her to have all her teeth and her lovely smile up to her 90th year. We are thrilled with Lauren’s smile! The veneers are seamless. One would never know that they weren’t part of her childhood! After ten years of waiting, we couldn’t imagine a better result! Thanks so much to you, and please extend our gratitude to your exemplary staff. I just wanted you all to know how much I appreciate your wonderful office. As you know, for a very long time the dentist office was not high on my list, but now I actually look forward to it. The new bridge looks perfect and I can’t wait to complete the rest of the work. It is a pleasure to refer persons to one who can make a smile beautiful! Thank you for the gift and the business cards. You are wonderful! Thank you for your call this beautiful evening in follow up to my visit to your office early this morning. As I indicated, everything is fine; I am in fine hands. You are a most caring, compassionate, and astoundingly competent dental physician. I am so thankful to have found a real dentist! No words to express how comfortable and at ease Dr. Marsh makes one feel while having dental work done. His patience and skill is admirable, and he is supported by a very caring staff. Dr. Marsh and his entire staff has it down pat for a comforting experience at the dentist. Thank you! Dr. Marsh and Debbie could not have been kinder or more professional. I was ‘wowed.’ Finally, thanks to Dr. Marsh, I see some light at the end of What’s been a dark tunnel. I made a smart decision when I called the office for an appointment! Thank you for your kindness and patience. From the moment I stepped into your office, I felt that I was in the best hands. You reassured me and calmed my fears. I am truly grateful. I have always dreaded going to the dentist. No more: since I have found your practice, I no longer feel that way. I enjoy each and every member of the Marsh dental team. They are the most caring and friendly people I have ever met. The dentist is so very talented and cares deeply for his patients. His wife handles insurance issues and is always so knowledgeable and prompt with submissions. I honestly can’t possibly do justice explaining how amazing the entire establishment is. Many people hate going to the dentist. I used to dislike going myself, but since I began going to Dr. Marsh I look forward to going each visit. I always have a great time at Dr. Marsh’s office. Debby did my cleaning and was very pleasant and thorough. Dr. Marsh is always friendly and gracious. The ladies at the front desk are always nice and helpful. Just a wonderful staff that helps Dr. Marsh. Also, I love the coffee and snack counter in the waiting area. Dr. marsh is such a talented dentist. I really enjoy seeing him and his work is first rate. I love my new smile-he really boosted my confidence level and I have received so many compliments on my teeth-just beautiful. Thank you so much Dr. Marsh. See you in 2018. Everyone was great as usual and Tracy is a pure genius fitting my new crown and making sure it was perfect. Thanks for always taking good care of me. Thanks for doing such a great job on my teeth. They look wonderful! It is always a pleasure to visit my favorite dentist and staff. Oh my goodness! The Christmas garden blanket was breathtaking and made it safely to “the westside!” I placed it on the corner outside my office so it could be shared and enjoyed by many. The card, however, was the best part – all of the heartfelt thoughts and messages. Whoever thought when I came to see Dr. Marsh and all of you in search of ‘a radiant smile’ a few years ago my family would become part of yours!!?? Thank you for your kindness, friendship, thoughtfulness and of course our ‘radiant’ smiles!! You cannot single out one individual member of this team. Each and everyone works to provide you with the best care and services they can. Every person I interacted with went out of their way to make me feel welcome and comfortable. I have full confidence that I will achieve optimum results as I move through the steps of my treatment plan. “You have a great smile!” they say. This is the first time Dr. Marsh has done specialized work on my older son (although he has taken care of his regular appointments since he was a baby). He looks fantastic and he hasn’t stopped smiling since the work has been done. In the past two weeks our son has already shown a desire to take much better care of his teeth and beautiful smile, and we know that is directly attributable to Dr. Marsh and his wonderfully friendly and patient staff. Now our son can get the same compliments I do! 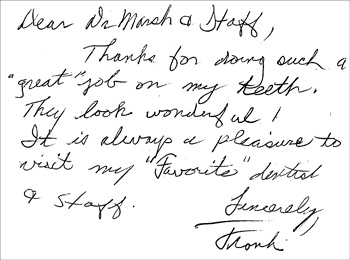 Dr. Marsh continues to have our highest recommendation! The entire staff was personable, friendly and knowledgeable of the procedure performed. The doctor was very genuine, sincere and made you feel comfortable with his wisdom and experience he demonstrated through his demeanor. The service is amazing. The staff always have a smile on their face and are very welcoming. Dr. Marsh did a great job on my gum contouring. It was pain-free and quick. The results were shocking. I am so happy I decided to get this procedure done and glad I chose his practice. The whole team was terrific! From Karin who welcomed me and got me started, Alysia and Wendy at the front desk, to Debbie and Dr. Marsh for the cleaning and exam – I was kept informed and felt secure that I would be taken care of – the experience was so positive I couldn’t be happier with my choice to come here. I have referred Dr. Marsh and appreciate his perfection, professionalism and warmth. Best dentist out there, in my opinion. Dr. Marsh and his staff are a pleasure to see and always make you feel welcome. Very professional, yet enjoyable to talk to. Doctor even calls you personally after a major dental procedure to see how you are doing. Wouldn’t go anywhere else and I live an hour away. Congratulations on the recognition! I am not surprised that you and your team are showcased for the work that you do. You are the best and I have enjoyed being a patient. Thank you so much for all you have done for me over the years. You are a blessing from God and I am so grateful for you all. May God bless you in the new year with health, hope & peace. Thank you for taking great care of me and my family. Dr. Marsh and staff are fantastic. Everyone is so friendly, while being professional too! 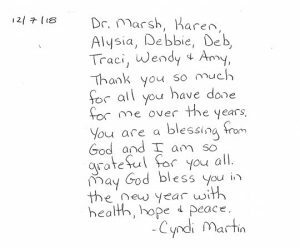 I enjoy recommending/referring Dr. Marsh and the team. It is difficult to single out any one person because they are always cheerful and welcoming. Thrilled with My New Smile! The entire staff was absolutely amazing and top notch. I have nothing but positive to say about the staff, the office and the procedures I had done. Can’t wait to go back for my next visit! I am thrilled with my new smile! …prior to my illness I was blessed with a perfect, natural smile – no braces, no cavities. I feel that today was a step toward smiling again. I truly appreciate all of your efforts on my behalf – you are an artist in the art of dentistry.